I despair dear bloggers, at the amount of "box ticking" we have to do in order to make ourselves look more attractive. When I was eating lunch with one barrister, he said that in his day, the people who marshaled with judges were creepy, and not that many people did it. The judge I was shadowing said that they had so many marshals that they had to set up new rules about when marshals could sit and eat lunch with the other judges.. I would like to say for the record that I am not creepy, ok perhaps slightly, you'd have to ask Bar or Bust. I suppose we are all looking for that special "spark" that will make us look good, make our CVs glow with fluorescent barristerial glee, that makes chambers go "Yes! We need him!" rather than "why do all these CVs look the same?" or "how do I choose between all these desperate people?" But my reasoning may be even political and perhaps it shouldn't. At the Scholarship Dinner, everyone placed immediately around me was from Oxbridge, five people all having being to an elite institution(s) was slightly disturbing (I mean no disrespect of course). I would have liked to have seen more diversity, especially from those who wish to go to the Bar now as recent graduates. 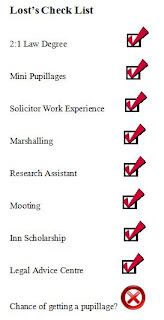 I'm not sure how many more boxes there are left to tick and I haven't as of yet applied for pupillage, but I feel that there is considerable strain upon many a law student to fulfil ALL these boxes and perhaps maybe many more, before ever being considered for pupillage. Of course it differs on each individual set, but the bar (excuse the pun) is high, and the dedication we have to show I'm sure is more than any other profession(apart from medicine).. and for what? Months (once you tot it all up) spending free time to further our careers? In the idealic search for a pupillage when you are competing against maybe 100-200 other applicants, with the same achievements? Do chambers even care? There is of course no point in doing things just to have them on your CV, (but we all secretly know that some of us HAVE to do things we don't like in order to have them on our CV.) I am beginning to feel that my desire to become a barrister has become a big, no sorry MASSIVE box ticking exercise, and I don't feel it should be. Labels: box ticking, CV, Pupillage. Creepy...not in the slightest. I understand what you mean by the whole 'ticking the box exercise'. It does seem now that there are a certain number of pre-requisites that without which you will not even get a second glance. The problem is what to have on top of that which will set you apart? It is important to note however that once you have got past the paper sift it is really down to performance on the day. I understand your frustration about box ticking. Even though you've filled the boxes sometimes it seems that others have filled them better! However, I think if you had applied for pupillages this year then you might be a little less frustrated. This year was my first round of applying and although I haven't secured a pupillage yet I did get 7 interviews when I was hoping to get 1 or 2. And as Bar or Bust says the box ticking allows you to get through the initial paper hurdle. Beyond that the questions that I have encountered in interview have had very little focus on the application and move towards testing your skills in person in terms of arguing a point. If you have now ticked the boxes, then the issue is what next ? What might give you the edge, make you different or stand out etc ? Discounting the compromising photos of head of chambers with farmyward animals approach, I wonder whether you need to look at the commercial aspects. Not knowing or caring much about the criminal bar, I am not claiming to be in the know, but it is a harsh fact that the independent Bar is self employed. No matter how good you are at whatever you do, if you are self employed in any walk of life, you need clients; if no one instructs you, you are screwed. End of. I cannot help but feel that more aspirants need to be way more clued up in this direction. So what might you be able to do which helps in this direction. it is not a fully formed idea but how about some form of website/blog aimed at providing information to instructing solicitors. Free and basic, but the sort of thing where you can put yourself out there, show you know your stuff (mixture of news, information, opinion etc) and from which you gain a presence. If you are not familiar, look at someone such as Daniel Barnet, the employment counsel. He has been doing something basic along these lines for donkeys years and must ny now have accumulated a mailing list running into the thousands. What with this new fangled inter-web thing, I remain slightly bewildered, if not a bit disappointed, that more people do not try to exploit this type of angle. Like most things, it is no guarantee of anything but what harm can it do ? If, in the space of a year, you can garner a mailing list of crim solicitors of even a relatively small number of say 100, that's 100 potential instructing solicitors with whom you have the ready means to contact and promote yourself, your future chambers to etc. I have not spent long in crafting this but, hopefully, you can see what I am getting at. Buttonfan - which areas do you apply for? I am terrible at interviews, do the BVC providers give you lots of practice or not? barboy - good idea, though a slightly scary one at that, I have done some case commentaries in the past, maybe I should do some more in the future, however I don't know if I would be taken too seriously? I appreciate the subject matter of the site is not your thing but you can see it is an excellent resource for anyone interested in that field. The academic who runs it is more "advanced" than you, but you can see what he is doing. I like the idea, as he says, of using the site as a "notepad", whereby he puts up links etc., probably as an adjunct to his private reading. In other words, not that much more effort for him anyway. I think that, at aspirant level, the emphasis does not need to be so much on being discursive (although best, methinks, to get used to expressing opinions sooner rather than later) but more in showing, as Dr Goddard does, that you are bang on top of your chosen field. Only trying to help. One does sense a kind of lemming mentality within the aspirant community collectively. People do the same thing (same boxes ticked approach) and then bemoan about not be able to stand out and get noticed. The system certainly encourages the herd approach but that is scant consolation to the disappointed individual. I think the essential problem, particlarly with the way that education has changed so much in recent years, is that aspirants, through no fault of their own, are being asked to move from a spoonfed, genericised uni type of environment into a brutal commercial world, and do so in one fell swoop. The Bar is unique, as best I know, in that an aspirant does not get the benefit of a few years of employment in which to adjust (e.g., before becoming a salaried and then equity partner in a firm of solicitors). You could say that the first six, before you are on your feet, serves the same function, but no chambers is going to take on a dud in the hope that they will change in such a short timeframe. In short, at the Bar, and pretty much immediately, you have to show that you are saleable material. Do you have the knowledge and the ability to apply that knowledge in the way which will cause people to pay you for it ? If not, you can have all the Oxbridge PhDs going, but no one is going to be interested. I guess what I am trying to say is that you will, at some point, have to show what it is you have to sell, i.e., what knowledge, skills, and to what market. And I kind of think that the earlier, the better, given how crowded the aspirant pool has become in recent years. Yep BB understandable, how are applicants to chambers to bring contacts with them, if they have no experience, as they have been through the machine factory of LLB then BVC. I think my time as a research assitant, might make me shine, but am told that some chambers can get a bit worried about being too academic. I've set up a blog on Criminal Law and Evidence (though in fact I haven't looked at Criminal Law since my first year) Just waiting and currently thinking what if any may be the repurcussions of things getting back to me, for if I am going to attempt to market myself, I will have to keep it as my real name, which I don't have a problem with, though others may ? Box Ticking is an unfortunate side effect of application for pupillage; in a competition as tight as the silly season, you really had best dot all your I's and Cross all your T's because if you dont, there are a THOUSAND others that will have done so, and with nobs on. I personally find it most distressing to see that we ALL have to go through this checklist only to have chambers apply some arbitrary and entirely secret selection critiera to a mass canditature who, in any other profession, would be lauded for their efforts to build such dazzling CV's, to be so academically and personally accomplished. I applied to criminal sets and to a few that dealt in other areas but had criminal as one of their practise areas. For criminal interviews it seems to be all about the advocacy as criminal is the main area where that is pretty much all you will do. I am starting the BVC in Sep so I'm not sure how much guidance they give on this. However, post interviews I think that doing the BVC will really help. Feedback I got said that my answers were good but that I needed a bit more confidence. The qs are not necessarily legally focused but normally require you to argue for one side, therefore demonstrating your skills. I don't think the BVC will necessarily improve the answers you give but will improve the way that you deliver them. Which esteemed establishment will you be attending in September? Lost, I apologise if I didn't explain the contacts point as intended. Unless you are moving laterally from another environment (such as a solicitor where you have pre-existing sources of work) I do not see how any aspirant can sell themselves on the back of being able to bring business to chambers, as fact. But I reckon all chambers will expect a successful candidate to show the potential to get in work, develop existing and new contacts, and build their own following. I think it is much about having the right mindset. Borrowing from a technique I have seen elsewhere, think of a pupillage committee speculating over them holding a drinks party to celebrate you becoming a tenant after your pupillage. You can invite ten people you know to meet everyone at chambers, have free plonk and to join in your success etc. Given that your mates from uni, nor your auntie, are likely to give the right impression, who would you invite ? I will be attending City for the BVC. I guess from Lost's comment you will be at the BPP? Anyone else going to City? No pain, no gain I believe the saying goes. If I am paying someone £14795 then I expect them to work me as hard as possible and give me my moneys worth.